Blades: Flat or folded, 3-17 inches long, less than 1/2 inch wide, mid-vein conspicuous beneath, rough on surfaces and margins when mature; tips tapered to points. Sheaths: Closed toward bases, glabrous; margins overlapping and fused. Ligules: Membranous, irregularly cut or torn. Inflorescences: Panicles, 2-8 inches long; major branches few. 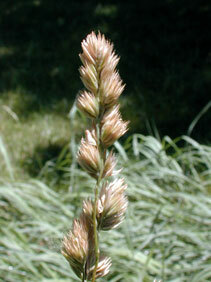 Spikelets: In crowded 1-sided clusters, on short stalks, 2-6-flowered, oblong, around 1/4 inch long, pale green to purplish; glumes and lemmas pointed or with short awns. Habitat: Fields, meadows, pastures, woodlands, lawns, and waste areas. Origin: Orchard grass was introduced to North America from Europe in the 18th century. It is now naturalized. Forage Value: It was cultivated as a pasture and hay grass and provides good forage for livestock and deer. Comments: Tufted. Orchard grass spreads aggressively and can become troublesome in lawns. It grows particularly well in shaded areas. When flowering, the pollen of orchard grass causes hay-fever.